"Do you know who I'm? ", my great grandmother asked looking into my eyes. A small chuckle went around the room that echoed with boisterous energy from the aunts and children that surround her bed. Perhaps they knew the answer, as did the old lady. I played with the idea of being honest with her, that my being a non-local and only occasionally travelling to the hometown on vacation every few years would be an excuse enough. But the more I looked at her, it ran through like flashes, the younger version of this old lady, which looked a lot like my grandma. "Go kiss her hand, she is your Nani", Ammi would hush me up and say whenever we saw her at social gatherings. I would go up to her and kiss her hand in respect. She never asked if I knew her and politely enquired about how I was. "Ofcourse, Badi Nani Ma I know who you are", I murmured half confidently. She fell into silence for a good few minutes. And we thought the conversation has ceased much to my relief. "I'm very content, I have everything I wanted and a good life. Now I want to just rest in peace", she said looking up at the fan that hardly rotated. At 17, I didn't quite know what contentment was but she looked contend. She looked ready to meet the earth. We absorbed the silence that her words had created, everyone stood still, including me, which I had never learned before. The silence was broken by the foot steps of her daughter in law, who walked in with a plate of aloo kheema and roti. The potatoes were mashed and the roti mashed to dough consistency with water. The symphonic aroma of spices now over powered every other smell even that of my ittar. "She still likes her food spicy and won't eat khichdi" said the daughter in law complainingly. Khichdi being subtly spiced rice and lentils dish that's often given to patient as it's filling and easier to digest. My grandma and I pulled her up to a sitting position. As her daughter in law started to feed her with her hands, her face brightened up, savouring each bite slowly in her almost toothless mouth. I thought she'll nibble daintily as someone preparing to meet the earth would, but if there was something she could still look forward too, it was the food. Perhaps, we would have got along quite well had she more time left to live. 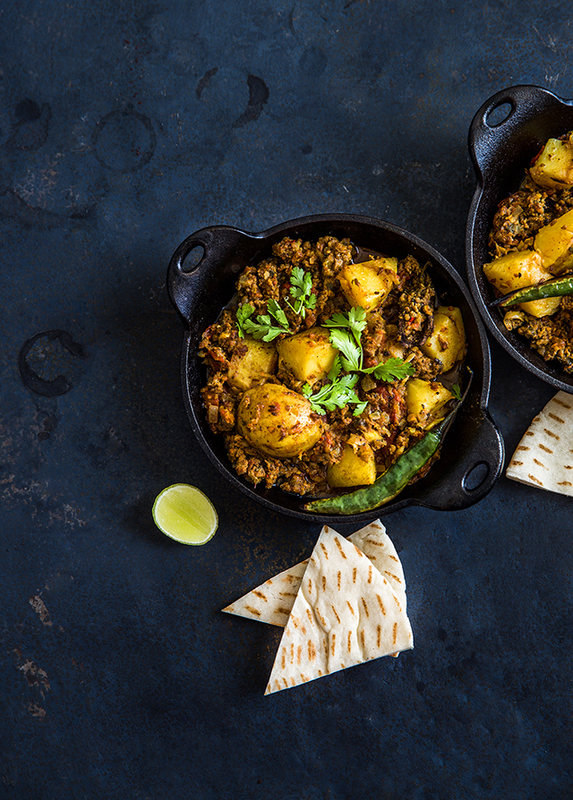 Aloo Kheema is a rustic meat and potato dish usually made in most parts of Northern India. Aloo refers to potatoes but kheema is a general term for mince meat of any type, goat meat being the most common. The recipe follows the simple Indian trinity of red onions, garlic and spices. Anything, that's rustic and made on regular basis in Indian homes is made sans a strict recipe, specially when it comes to spices. 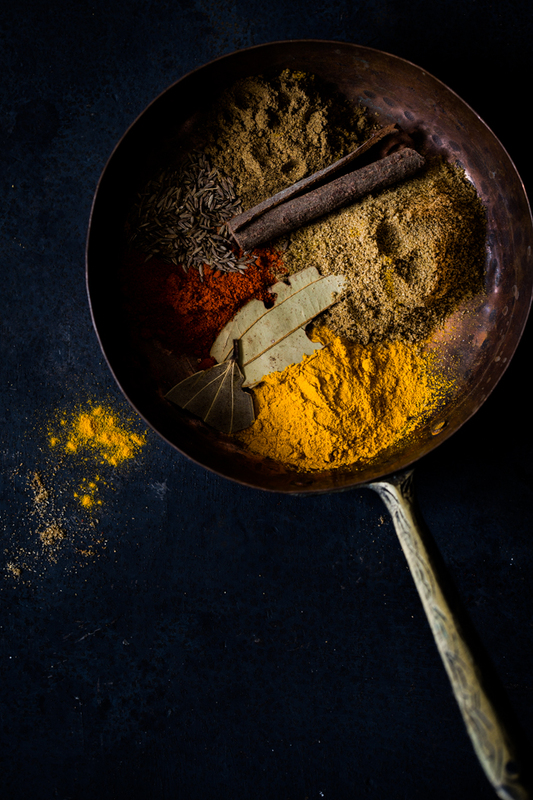 When we make it at home, I alternative between simply being generous with ground garam masala to sometimes when I feel like, I'll bring out all the whole spices like cinnamon, cardamom - black and green, cloves, bay leaves and star anise. Usually though, I'll opt for a middle route, cinnamon and bay leaf sizzled in ghee and just the right pinch of garam masala. Once the spices sizzle add the onions and cook them until translucent. Tip in the ginger and garlic paste. Add in the turmeric, red chilly and coriander powder. Once the spices cook out a bit (around a minute), add the mince meat and potatoes. Let them brown a little for around 3-4 minutes. Finally, add the tomatoes and give it a good mix. Generally I find that two large tomatoes create enough moisture to cook the meat and potatoes in but if you find it particularly dry, add a splash of water to keep things moving. Cover and cook until the meat is cooked through and potatoes are fork tender. Add the garam masala and cook for another minutes. Serve with roti, naan or pita bread. Garnish with coriander leaves and lemon wedges. I loved your story about your Nani... I would give anything to kiss my Nani's hand one more time. I love Kheema and can't wait to try your version. I'd also love to see your version of Khichdi, maybe sometime in the future, you can post that recipe. Thank you for sharing your story, and this recipe. Thanks for mentioning the Khichdi - I'm excited someone would be interested in the recipe, I love it! And thank you for your kind comment. A tasty combination and droolworthy dish. I particularly like the picture of the spices. My goodness... I must make this for Eric. He loves all lamb dishes, but with all of these spices he's sure to go crazy over it. How beautiful Kulsum! Felt like I was in the room with you and your great-grandmother. I miss mine,she loved food and life too! Thanks Rose. It's strange because I hardly know her but even then (when I didn't cook) I connected her memories with food. So true about rustic everyday recipes, that they have no standard recipe. The spicing changes with seasons and moods, each family adds a signature to these. I cook alu keema with fat red chillies or fat green chillies sometimes and love it. Nani's are the best! Reading your story reminded me of mine and how much I miss her!! This mince looks so flavorful and your photography is stunning! Dear K, Im thrilled with this recipe. I just tried it and my home is filled with the delicious aroma. Simply amazing. Thank you. What a lovely memory. I too felt I was in the room with your family.